Memory cards and camera batteries are often a target of counterfeiters. However, it seems that lenses are not spared of this either. Canon has announced that some of the lenses brought into their service center for repair are fake. The counterfeited model is EF 50mm f/1.8 II. Regarding this issue, they advise the users how to recognize the counterfeit lenses. Unfortunately, the exterior of fake lenses is difficult to differentiate from the original. They faithfully imitate all the external details, although the parts and electric circuits are different from the genuine model. However, one detail on the outside can tell you whether your lens is genuine or fake. Canon advises the users to review the location of the company name on the mount when the lens cap is removed. The letters can be either printed or molded, but the difference is in the space between the words “Canon” and “Inc.” If there is no space between the words, the lens is fake. If there is, then it’s real. You can see the examples in the photos below. Canon Inc. makes an appeal for all the buyers to register their Canon products if they haven’t done it already. There is also a useful (and even fun) section on their website where you can learn more about counterfeit and how to recognize fake products. If you are planning to buy a “nifty fifty”, make sure to pay attention to this detail and only buy from reputable retailers. And for those who already have this lens – have you checked it? 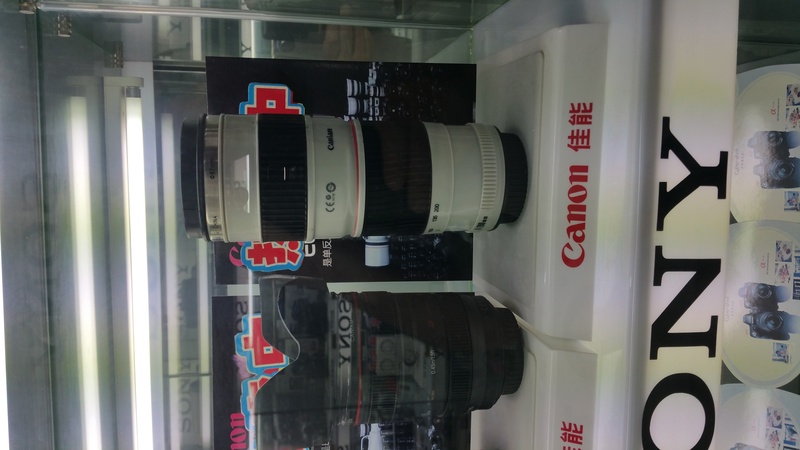 Caniam lenses, as seen in a big shot in Tian He, GuangZhou in June 2015 ! Those are mugs made to look like lenses. They cannot use the Canon trademark name on the mugs, so they say Caniam instead. Do you think they care ? No, no, those were lenses, not mugs. You must doubt everything when you go to those “Electronic markets”. Another example : I bought a perfectly authentic Samsung external hard drive that contains a Seagate drive … The USB interface just shows a “Generic Mass Storage device”. The second one I bought for a relative was supposedly identical, but had a real Samsung drive this time, and the USB interface told so. The objects in your picture are definitely mugs. Do a google for Caniam and you’ll get results for a whole lot of mugs made to look likes lenses. Those are mugs, and Seagate bought Samsung’s hard drive business in 2011. Ha, I have 2. One is totally fake I guess. AND IT’S THE SHARPER ONE. the fake one is better. dxomark says the fake one is way sharper. digitalrev says the fake one has better bokeh. thecamerstore says the fake one is lighter. canon says the fake one is fake. Ken Rockwell says the fake one is the best lens he’s ever owned. TheAngryPhotographer says that it’s not fake enough. Lens Rentals wants to test it but they need 10 copies and only have 2. Kai is going to test which one burns the longest. I’m going to make a moderatley funny comment on disqus about it. All three of them that I have owned: might be. Do I care? No. Can I notice it in resolution/build quality? No. Either Canon surpasses the competition in value or…..
Ha! Mine has no writing at all on the metal band. Mine is nifty and it’s 50…so who cares?